Here is a list of computer music software which will be available for use in the Electronic Classroom along with links to downloads, info, support, etc. A more complete list of links to computer music software can be found on the Computer Music Links page. Check out PLUM (Programming Languages Used for Music). Check out CCRMA's Computer Music Software page (Stanford Univ.). Check out Tom Erbe's Computer Music Software page (CalArts). 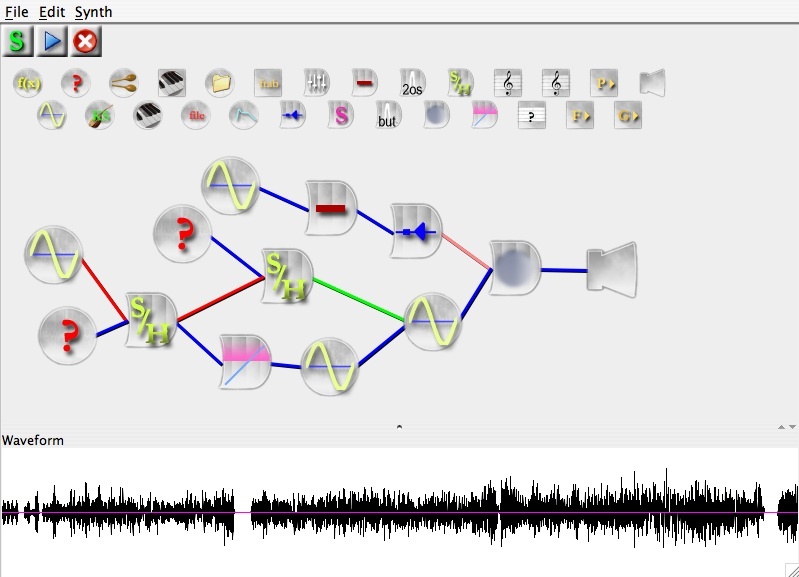 JSYD is an instrument editor and software synthesizer by Jim Bumgardner. It has a graphical "patch cord" interface, and is relatively easy to use, compared to other music languages. It is particularly suitable for teaching computer music. Both Macintosh and Windows versions are available. SYD Central. (JSYD homepage) Includes downloads for MAC and PC versions, documentation and tutorials. The MOST CURRENT VERSION of JSYD can be found HERE. Amadeus II is a powerful tool designed to manipulate, create and analyze sounds. The release available on this page offers a lot of useful features like for example Very fast direct-to-disk abilities. This allows you to manipulate sounds of any size without running out of memory if there is enough disk space left. Multiple undoing and multiple scraps. Full Mp3 support, thanks to the integration of the LAME ancoding engine. Powerful repair function that allows to search the sound for cracks and eliminate them. Extensive support of markers, which facilitate navigation through huge sounds. A "Selection" menu provides a lot of functions that allow to control the selection in a very precise way. This greatly facilitates the editing of a document. Long processes can be interrupted during their execution; several processes can be launched at the same time. High-resolution sonograms, Multiband RTA, Waterfall display, 3-D Spectrums, etc. Support of variable bitrate Mp3 encoding. Support of the new Ogg Vorbis file encoding format. Exporting of markers as cuepoints in WAVE and AIFF files. Support of the SoundDesigner II file format. VST plugins are now supported. Runs only on PowerPC Macintosh compatible machines with MacOS 8.6 or later and CarbonLib 1.0.4 or later. Don't try to use on Windows or Unix machines! !